The granny game is now updated with new items; previously, the player could find the keys such as weapon key, master key, safe key in the cabinets, kitchen, and drawers. But after the update, things have been changed. Now there are hidden rooms, hidden doors, and hidden items. Granny Game is now much more complicated. But we are here to help you. The summary of this game; You have 5 days to escape the house. You have to find keys, codes, hammer to escape the house. Granny’s house is like the labyrinth. Hidden rooms are connected with each other and there are many ways to go to a particular location. Finding these items is not an easy task. It might take an hour, half an hour or few minutes. It depends on your strategy. 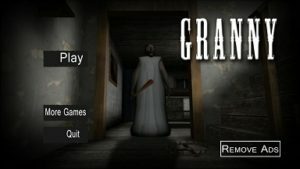 Now, let’s start the Granny Game[Horror] walkthrough, guide, tips, and cheats. 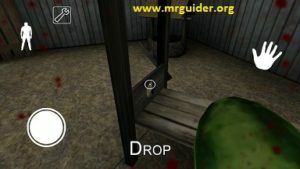 Version 1.5 – Escape the Granny House by breaking the garage wall, read here. We have updated this post and added all the details(As per the latest version of Granny Game). September 2018. 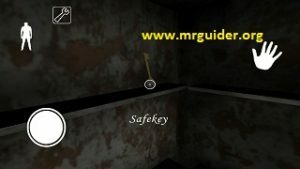 You can easily complete the game if you know about the Granny House[check out the full map; hidden rooms, gateways below], and the items needed to escape the house. Melon, this item was added in the latest update. You can find melon inside the drawers, under the water well, in shelters/mini-house, hidden rooms. Don’t worry, I have explained how to go to these places in the walkthrough below. Once discovered, you need to cut it. How to cut the melon in Granny Game? Go to the backyard; you will see Guillotine. Go close to it, tap on the hand icon and then point to its handle and then tap on the hand icon again to cut the melon. You will get a key; either weapon key or master key or padlock key or playhouse key or weapon key or safe key. Now the question is where is the key? Answer; There is no exact location to find these keys. You can get one of these keys by cutting the melon or by opening the machinery part, inside the playhouse, in sockets board. Rest keys such as safe key, padlock key or more can be found in the drawers, in the safe, in the socket board. Don’t worry! Just read the complete post; I have explained some cheats and tips below to complete the Granny Game. Winch Handle can be found in the kitchen, in the rooms, above shelves, or in the drawers. Why do you need to find it? Winch handle is one of the main items in Granny Game, you use it with water well to pull up the bucket. One can get a key, melon or other tools such as the hammer, screwdriver, keys from the water well. 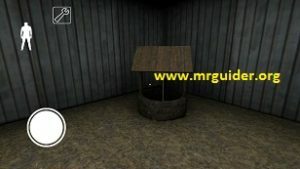 Where is the water well in Granny Game? Go to the backyard -> near playhouse. Where is the hammer in Granny Game? 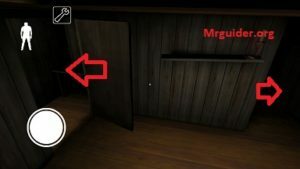 Hammer can be found in the kitchen, in the hidden rooms, above the shelves, in the drawers, under the well, in the basement, hidden rooms(read the walkthrough below). Hammer is the most important item. Why? To break the wooden pluck attached to the main door(safety). There are two rooms on the top floor. To enter into these rooms; the player needs to pluck the wooden piece. And there is a gap to enter the second room. After you pluck that wooden piece, place it to cover up the gap and enter the room. You can get keys or other tools from these rooms. And the hammer also used to break the security of the main door. So hammer is a much-needed item in this horror game. (Refer to Cut 2 – Top Floor – Below). This is not insane? In Granny Game, the screwdriver is another one of the main items. Why we need a screwdriver? To open the USB wall sockets. You can find keys inside these sockets. In the walkthrough guide below, read the step 13. At this step, you will find this socket attached to the stairs. To open this socket, you need a screwdriver. As you can see in the above picture, a small box is highlighted and it is above the shelf. How to reach there? Find the weapon key. 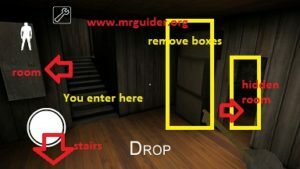 Open the hidden room(read the step 7 in the walkthrough below, at the left side, there is a room. Open it using the weapon key). After it, get the crossbow and the dart. Use this weapon and hit that small box. After it, get the screwdriver. Open the socket and you could get a key; maybe master key or padlock key or any other key. Where is the code? The code is another item used to break the security of the main door. The code can be found in the cabinets, inside the drawers, in the bathroom. Cutting Plier used to cut the wires and to break the security of the main door. It is also used on the top floor. Where is cutting plier? Find in; hidden rooms, drawers, shelter, above shelves, in the basement. There is a playhouse in the backyard. To open it, you need a playhouse key. Enter the playhouse, you will see a machine part. You have to open it, there are two cogwheels you need to find in order to open that part. Inside that machine part, you can find a key; master key, safe key, or other tools or the code. Where to find these cogwheels? Look into the sockets, find in the rooms, in the drawers, basement, hidden rooms, at the top floor rooms. These items are useless. You don’t need to find these items as there is no use. Crossbow is a weapon, you can use it to get rid of Granny for 15 seconds, to avoid Spider, in getting the screwdriver. You can find it in the hidden room. That’s it. What did we learn so far? Items required, how to get keys, code, and other tools and why and how to find them. Now, you have to find more items in this game to escape the house. The recent update added a new location in Granny’s house -> Garage. 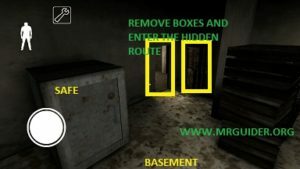 There is a garage; go to the basement(read the walkthrough below to know the easiest way to go to the basement). At the backside of the basement, now there is a hidden room. Go there, it’s garage. There is a car inside the garage. To open the car boot, you need a car key. And inside the car boot, you could get a hammer, other keys, winch handle, melon, or any other item. Items to drive the car; Car Engine, battery, gasoline can, wrench, spark plug. Don’t know how to fit these items in the car bonnet? -> Read the full guide here. Car Key – Car Key can be obtained from the bathroom, inside the drawers, cabinets, rooms, backyard, kitchen, shelf – there is no exact location. For the first time, I found it in the bathroom. Now, you have two weapons to beat the Granny; Crossbow & Shot Gun. One can easily obtain the crossbow using the weapon key because the exact location of the crossbow is weapon room(read the walkthrough below). Go to the garage and there you will find ammo. To use ammo, you need a shotgun. And to get a shotgun, you have to collect three shot-gun parts -> Find them in the kitchen, rooms, drawers, or other places. Go to the garage -> close to ammo place -> assemble all the parts and you are good to go. You can use the shotgun to beat the Granny – only for 30 seconds. There is a small room at garage location. If you do make some noise there, Granny will go inside it. Once she goes inside that room, turn on the switch and close the door using the safety. You can hide inside the car to avoid getting killed by Granny. Just go to the left side of the car and at the top-right of the screen, tap on the car icon. Step 1.) 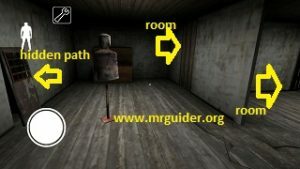 Read the walkthrough below and go to the basement. Go to the back side of the basement and there you will find a room. Step 2.) Go into that room. That’s it. You are in a garage. There you can assemble the parts of the shotgun. Use the shotgun to kill Granny and find other items. Update ends here. 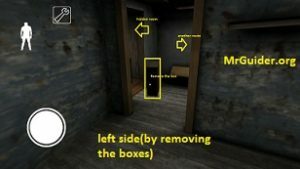 Continue the main part: —Now, let’s start the Granny Game walkthrough; I have mentioned hidden rooms and secrets frequently, in this part, we will talk about how to go through these rooms and find those items. Granny House; capture the image of every route in your mind, learn the path, and it would help you to complete the Granny Game in minutes. Cut 1.) You are in a dark room. There is a cabinet, some more items, and a drawer. Check the drawer, if there is an item, then pick it. Go close to the door and open it. Cut 2.) You will see this view. Cut 3.) Now go to the left side and enter the room. Cut 4.) You will see this view. Granny Game; Hidden Room (1). Cut 5.) There is one hidden room next to it. Sometimes, it’s covered with wooden boxes or sometimes not. If it’s covered, then go to the right side of it and move left side. This action will remove those boxes. Cut 6.) You will see the stairs. Go to the next room through stairs. Cut 7.) You will see this view. Cut 8.) On the right-hand side[Back view], there is a hidden room. You need a weapon key to unlock it. Granny Game; Hidden Room (3). On the left-hand side[Back view], there are some boxes. Behind these boxes, there is another hidden room. You can remove these boxes; go to the right side of it, then move left side. Apart from these two hidden rooms, you can go below. There are stairs. There is a drawer too. Open it and check for the items. Cut 9.) Go down through stairs. At this floor, there is a room just in front of the stairs. Go close to it and tap on the hand icon. And at the right side of the stairs, there is another path; go there through stairs. Cut 10.) You will see this view. Cut 11.) At this floor, there is a hidden route to the basement. And go to the right side of the stairs, there is a socket. Open it, you can get a key or other tool. The screwdriver is needed to open this socket. Cut 12.) At the right side, follow the stairs and you will see a hidden route to the basement. Change to crouching position and enter the basement. Cut 13.) In the basement, there is one more hidden route to the playhouse. And there are some more things; look at on the bench, there is a safe and electric socket too. Find items in these things and continue. Where is the hidden route? Near the safe, in the basement, you will see some wooden crates. Move them(go right side of it and move to the left side). Enter the hidden room. Change to crouching position and go straight. Cut 14.) This route will drive you to the shelter, in the backyard. Open the door and enter the backyard. Cut 15.) Backyard; you will find the water well, machine to cut the melon, and a playhouse. Just close to the playhouse, there is a window. Go close to it and tap on the hand icon to enter the kitchen. You can go to the basement and the backyard through the main floor and kitchen respectively. But I have mentioned the safe route. Cut 1.) Open the door(starting the game). Go to the left side, then move straight towards the front room. Open it and go to the top floor. Cut 2.) You will see this. Cut 3.) There are two rooms; enter it by plucking the wooden piece using the hammer. Place the wooden piece to cover up the gap. Cut 4.) There is a hidden route too. Just at the left side, remove that part[see picture above]. Enter into it to hide from Granny. Now, there is another room on the top floor(see cut 2 picture). To open it, you need a special key. Once done, move to the next room through this secret route. There is a cabinet. And it contains an item. Open the cabinet and grab the item. But there is one more challenge; Spider. Spider is the pet of Granny(in that room). There are two ways to avoid it; use the shotgun/crossbow. Second Way: – Find the meat piece in Granny’s House. Once found, go to that room. There you will find a plate. Put the meat piece on it. This will distract the spider and you will be able to open the cabinet. You can not pick up multiple items at the same time. So, whenever you pick up another item, then the character will automatically drop the previously equipped item. Remember that place because items used for multiple purposes. If you are having trouble completing the Granny Game, then here are some tips: – Your main objective is to unlock the main door. Don’t think about Granny! First of all, find the hammer and break those wooden plucks attached to the main door. You can pick only one item at a time. So, to pick another item you have to drop the item you have already equipped. Make sure to drop on a good place so that you can pick it easily to use it again. Next, find the keys; mastery key, padlock key, weapon key, playhouse key, and safe key. “Weapon Key” is the best. Use this key to unlock the hidden room[read above] and get the crossbow. Crossbow is the only weapon you can use to beat Granny in the Granny Game. But only for few seconds. Use it at the right time and don’t forget to pick it again after one-time usage. Next, find playhouse key and cogwheels to unlock the playhouse. You will get one key from the playhouse. 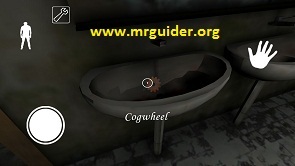 Cogwheels can be obtained from the backyard room, on the top floor, and in the basement. Once you gather all the keys, it’s time to open the main door. Use the crossbow to beat the Granny and start using keys to unlock the main door. It sounds easy! But actually, it’s not. There is a secret trick and using it, you can easily complete the game. First of all, pick the flower pot(where you spawn -> there is a flower pot on the table). Then go to the basement. Go to the backside of the basement(behind the stairs). You will find a hidden route – garage. Inside the garage, there is another room. Open it and drop the pot there. After dropping, hide inside the car. And as you know, Granny listens to everything and when you drop the pot there, she will go inside the room. Get out of the car when you see Granny has entered the room. Close the door and turn on the switch and Granny will disappear for a few minutes. That’s it. Now gather all the keys, open the door and escape the house. Keep in mind that Granny will come again after a certain amount of time. Keep patience, use the bed, cabinets, and other hidden locations to hide there and survive in Granny game for a long time. If you know the whole map, then you can easily complete the Granny Game in a short time! Read all the cuts above and check out all the hidden rooms list. Play the easy mode, disable the dark mode, and then it will be easy for you to unlock the door. Keys, weapons, and all other items are very important. And there is no exact place to find out these items. So, you have to check each room, drawers, rooms, and cabinets. Play carefully and you are good to go!